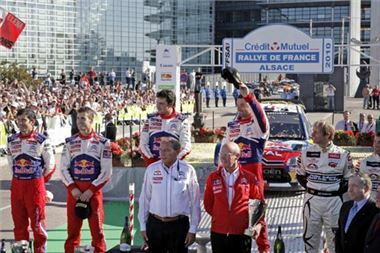 When Sébastien Loeb and Daniel Elena stopped their Citroën C4 WRC in front of the Haguenau town hall on Sunday, they had just scored their sixtieth victory in the WRC, and bagged their seventh consecutive FIA World Rally Championship title. In addition to a performance, unique in the annals of motor sport, Loeb had made the hearts of over 300,000 spectators who were all rooting for the local lad jump for joy. Dani Sordo and Diego Vallejo’s second place helped the Citroën Total World Rally Team secure its sixth Manufacturers’ World Championship title. *Subject to the official publication of results by the FIA.